The international workers’ movement is currently going through a particular transitional stage, which presents both the Communist International as a whole and its separate sections with new and important tactical problems. Basically, this stage can be characterised as follows: the world economic crisis is worsening; unemployment is growing; in almost every country international capital has gone over to a systematic offensive against the workers, the main evidence of which is the capitalists’ cynical and open attempts to reduce wages and lower the workers’ general standard of living; and the bankruptcy of the Versailles peace is steadily becoming more apparent to the vast majority of workers. It is obvious that unless the international proletariat overthrows the bourgeois system a new imperialist war, or even several such wars, is inevitable. The Washington conference is eloquent confirmation of this. A certain revival of reformist illusions which, due to a whole series of circumstances, had begun among fairly wide sections of workers is now, under the pressure of reality, beginning to give way to a different mood. The democratic and reformist illusions that re-emerged, after the imperialist carnage had ended, among some workers (on the one hand the more privileged workers and on the other the more backward, less politically experienced workers) are fading, having failed to flower. The future course and outcome of the ‘work’ of the Washington conference will upset these illusions even more. If six months ago it was possible to speak with some justification of a general move to the right among the working masses of Europe and America, then today it is possible to state with certainty that an opposite move to the left has begun. On the other hand, under the influence of the mounting capitalist attack, there is anew mood among the workers – a spontaneous striving towards unity, which literally cannot be restrained, and which is a development paralleled by the gradual growth in the confidence felt by the broad mass of workers in the Communists. The Communist Parties can and should now gather the fruits of the struggle they waged earlier on, in the wholly unfavourable circumstances of mass apathy. But as confidence steadily grows in those who are most uncompromising and militant, in the Communist elements of the working class, the working masses as a whole are experiencing an unprecedented longing for unity. The new layers of politically inexperienced workers just coming into activity long to achieve the unification of all the workers’ parties and even of all the workers’ organisations in general, hoping in this way to strengthen opposition to the capitalist offensive. These new layers of workers, who have often not previously taken an active part in political struggle, are now finding a new way to test the practical plans of reformism in the light of their own experience. Like these new layers, considerable sections of workers belonging to the old social-democratic parties are even now unwilling to accept the attacks of the social democrats and the centrists on the Communist vanguard. They are even beginning to demand an agreement with the Communists, but at the same time they have not outgrown their belief in the reformists and large numbers of them still support the parties of the Second and the Amsterdam Internationals. They do not formulate their plans and aspirations all that clearly, but in general the new mood of these masses comes down to a wish to set up a united front and make the parties and unions of the Second and the Amsterdam Internationals fight alongside the Communists against the capitalist attack. To that extent, this mood is progressive. The most important point is that their faith in reformism has been broken. Given the general situation of the workers’ movement today, any serious mass action, even if it starts with only partial slogans, will inevitably bring to the forefront the more general and fundamental questions of revolution. The Communist vanguard can only gain if new layers of workers are convinced by their own experience that reformism is an illusion and that compromise is fatal. When the birth of a conscious and organised protest against the treachery of the leaders of the Second International was still in its early stages, these leaders kept control of the entire apparatus of the workers’ organisations. They ruthlessly manipulated the principle of unity and proletarian discipline in order to stifle revolutionary proletarian protest and, without opposition, to place the entire power of the workers’ organisations at the service of national imperialism. Faced with these circumstances, the revolutionary wing had at any cost to win freedom of agitation and propaganda, i.e., the freedom to explain to the working masses that this is an unprecedented historical betrayal, and that it has been committed – is still being committed – by the parties and unions they themselves created. The Communist Parties of the world, having secured complete organisational freedom to extend their ideological influence among the working masses, are now trying at every opportunity to achieve the broadest and fullest possible unity of these masses in practical activity. The heroes of the Second and the Amsterdam Internationals preach unity in words, but deny it in action. Now that the reformist compromisers of Amsterdam have failed in their organisational attempt to suppress the voice of protest, criticism, and revolutionary aspirations, they are looking for a way out of their own impasse and are bringing splits, confusion and organised sabotage to the struggle of the working masses. One of the most important tasks facing Communists is to expose publicly these new forms of the old treachery. However, the diplomats and leaders of the Second and Two-and-a-Half Internationals have lately been forced in their turn, by profound internal processes that stem from the general economic position of the working class in Europe and America, to push the question of unity into the foreground. Though, for the inexperienced sections of workers just becoming politically aware, the slogan of the united front is a genuine expression of their very real desire to rally the forces of the oppressed class against the capitalist attack, for the leaders and diplomats of the Second, Two-and-a-Half and Amsterdam Internationals the adoption of the slogan of unity represents a new attempt to deceive the workers and a new way of drawing them onto the old path of class collaboration. The approaching danger of a new imperialist war (Washington), the growth of armaments, the new imperialist treaties agreed on behind the scenes – all this not only fails to make the leaders of the Second, Two-and-a-Half and Amsterdam Internationals sound the alarm and uphold in deeds rather than words the international unification of the working class, but, on the contrary, is bound to provoke inside the Second and Amsterdam Internationals the same kind of friction and division that can be observed in the camp of the international bourgeoisie itself. This process is inevitable in as much as the cornerstone of reformism is the solidarity of the ‘reformist-socialists’ with the bourgeoisies of their ‘own’ countries. Weighing up the situation, the Executive Committee of the Communist International finds that the slogan of the Third World Congress of the Communist International, -"To the masses!”, and the overall interests of the Communist movement require that the Communist Parties and the Communist International as a whole support the slogan of a united workers’ front and take the initiative on this question into their own hands. In this, the tactics of each Communist Party must of course be concretised with regard to the conditions and circumstances of each particular country. In Germany the Communist Party at its last national conference supported the slogan of a united workers’ front and recognised the possibility of supporting a “united workers’ government”, provided it was willing to mount a serious challenge to capitalist power. The Executive Committee of the Communist International considers this decision entirely correct and is sure that the German Communist Party will be able, while fully maintaining its independent political position, to reach all sections of workers and strengthen Communist influence among the masses. In Germany, more than anywhere else, the broad masses will daily grow more convinced that the Communist vanguard was absolutely right in not wanting to lay down its arms at the most difficult time and in persistently exposing the hollowness of the reformist stratagems put forward to overcome a crisis that can be resolved only by proletarian revolution. By following this tactic, the Party can group around itself all the anarchist and syndicalist elements standing aside from the mass struggle. In France the majority of politically organised workers support the Communist Party. This means that the question of the united front is posed rather differently in France than in other countries. However, it is essential that here, too, the entire responsibility for any split in the united workers’ camp should lie with our opponents. The revolutionary section of the French syndicalists is entirely correct to wage its fight against a split in the trade unions, i.e., for the unity of the working class in its economic struggle against the bourgeoisie. But the workers’ struggle does not end in the industrial sphere. Unity is also essential in view of the growing wave of reaction, of imperialist policies, etc. The policies of the reformists and centrists have led to a split in the Party and now threaten even the unity of the trade-union movement, which is objective proof that both Jouhaux and Longuet are playing into the hands of the bourgeoisie. The slogan of proletarian unity in the economic and political struggle against the bourgeoisie is the best means of defeating these plans for a split. In Britain the reformist Labour Party has refused to allow the Communist Party to affiliate on the same basis as other workers’ organisations. Influenced by the growing mood among the workers in favour of unity, the London workers’ organisations recently passed a resolution supporting the affiliation of the British Communist Party to the Labour Party. In Italy the young Communist Party is bitterly opposed to the reformist Italian Socialist Party and the social-traitors of the Confederation of Labour who have just sold the cause of proletarian revolution down the river; nevertheless it is beginning to conduct its agitational work around the slogan of a militant united proletarian front against the capitalist offensive. The Executive Committee of the Communist International considers that this agitational work is entirely correct and insists only that it be intensified in the same direction. The Executive Committee of the Communist International is sure that the Italian Communist Party, with sufficient far-sightedness, will be able to give the whole International an example of combative Marxism, by ruthlessly exposing at every step the half-hearted treachery of the reformists and the centrists (who have adopted the guise of Communists) and simultaneously by conducting a tireless campaign for the unity of the workers’ front against the bourgeoisie – a campaign that must steadily grow and involve larger and larger sections of the masses. In Czechoslovakia, where the Communist Party has the support of a significant section of the politically organised workers, the tasks of the Communists are in some respects analogous to those of the Communists in France. While strengthening its independence and weeding out the last traces of centrism, the Communist Party of Czechoslovakia must also be able to popularise within the country the slogan of the united workers’ front against the bourgeoisie and must use it once and for all to expose the leaders of social democracy and the centrists as agents of capital in the eyes of the most backward workers. At the same time the Czechoslovak Communists must strengthen their efforts to win the trade unions, which are still to a significant extent in the hands of the scab leaders. In Sweden the recent parliamentary elections have created a situation which will allow the small Communist fraction of deputies to play a major role. Mr. Branting, one of the most prominent leaders of the Second International and simultaneously prime minister for the Swedish bourgeoisie, is at present in such a position that, if he wishes to secure a parliamentary majority, he cannot remain indifferent to the actions of the Communist fraction in the Swedish parliament. The Executive Committee of the Communist International believes that the Communist fraction in the Swedish parliament may, in certain circumstances, agree to support the Menshevik ministry of Branting, as was correctly done by the German Communists in some of the provincial governments of Germany (for example, Thuringia). However, this certainly does not imply that the Swedish Communists should limit their independence in the slightest, or avoid exposing the character of the Menshevik government. On the contrary, the more power the Mensheviks have, the more they will betray the working class and all the greater must be the Communists’ efforts to expose these Mensheviks in the eyes of the broadest sections of workers. The Communist Party must also set about involving syndicalist workers in the common struggle. In America the unification of all the Left elements in the trade-union and political movement is underway, and if the Communists occupy a central place in this Left unification, it will give them the opportunity to implant themselves in the broad masses of the American proletariat. The American Communists must form Communist groups wherever there are even a few Communists, must be able to stand at the head of this movement for the unification of all revolutionary forces and should particularly now raise the slogan of a united workers’ front, for example to defend the unemployed etc. The chief accusation levelled against the Gompers trade unions should be their unwillingness to participate in the setting up of a united workers’ front against the capitalists and in defence of the unemployed, etc. However, attracting the best elements from the IWW still remains the main task of the Communist Party. In Switzerland our Party has been able to score a few successes by following the path we indicated. As a result of the Communists’ agitation for a united revolutionary front, the trade-union bureaucracy has been forced to call a special trade-union congress. At the congress, which is due to take place soon, our friends will be able to expose to all the Swiss workers the lie of reformism and so help boost the revolutionary solidarity of the proletariat. In a number of other countries the question presents itself differently, in accordance with a whole series of different local conditions. Having made the general line clear, the Executive Committee of the Communist International is confident that individual Communist Parties will know how to apply it in accordance with the conditions prevailing in each country. The Executive Committee of the Communist International considers that the chief and categorical condition, the same for all Communist Parties, is: the absolute autonomy and complete independence of every Communist Party entering into any agreement with the parties of the Second and Two-and-a-Half Internationals, and its freedom to present its own views and its criticisms of those who oppose the Communists. While accepting the need for discipline in action, Communists must at the same time retain both the right and the opportunity to voice, not only before and after but if necessary during actions, their opinion on the politics of all the organisations of the working class without exception. The waiving of this condition is not permissible in any circumstances. Whilst supporting the slogan of maximum unity of all workers’ organisations in every practical action against the capitalist front, Communists cannot in any circumstances refrain from putting forward their views, which are the only consistent expression of the interests of the working class as a whole. The Executive Committee of the Communist International considers it useful to remind all fraternal parties of the experience of the Russian Bolsheviks – the only party so far to succeed in defeating the bourgeoisie and taking power into its own hands. During the fifteen years that elapsed from the birth of Bolshevism to its victory over the bourgeoisie (1903-1917), Bolshevism never ceased to wage a tireless fight against reformism or, to use another name, Menshevism. Nevertheless, during these fifteen years the Russian Bolsheviks often made agreements with the Mensheviks. The formal split with the Mensheviks took place in the spring of 1905, but at the end of that year, influenced by the stormy development of the workers’ movement, the Bolsheviks temporarily formed a common front with the Mensheviks. The second formal split with the Mensheviks finally took place in January 1912, but between 1905 and 1912 separation gave way to unifications and semi-unifications in 1906-7 and also in 1910. These unifications and semi-unifications were caused not just by fluctuations in the factional struggle, but by the direct pressure of broad sections of workers who were beginning to be politically active and were in fact demanding the opportunity to test by their own experience whether the Menshevik path really did fundamentally diverge from the path of revolution. Before the new revolutionary upsurge that followed the Lena strikes, [the Lena is a Siberian river. The strikes which occurred in the Lena area in early 1912 gave rise to a vast movement of solidarity on 1 May of that year, which marked the beginning of the revival of the revolutionary movement.] not long before the start of the imperialist war, the working masses of Russia were particularly eager for unity and the diplomat – leaders of Russian Menshevism tried at the time to use this for their own ends, in much the same way as the leaders of the Second, Two-and-a-Half and Amsterdam Internationals are trying at present. The Russian Bolsheviks did not respond to the workers’ eagerness for unity by rejecting any and every united front. On the contrary, to counter the diplomatic game of the Menshevik leaders, the Russian Bolsheviks put forward the slogan “unity from below – , i.e., unity of the working masses themselves in the practical struggle for the revolutionary demands of the workers against the capitalists. Events showed that this was the only correct response. As a result of this tactic, which was modified to suit the circumstances of time and place, a large number of the best Menshevik workers were gradually won over to the side of Communism. Since the Communist International is putting forward the slogan of the united workers’ front and permitting agreements between individual sections of the Communist International and the parties and unions of the Second and Two-and-a-Half Internationals, it obviously cannot reject similar agreements at an international level. 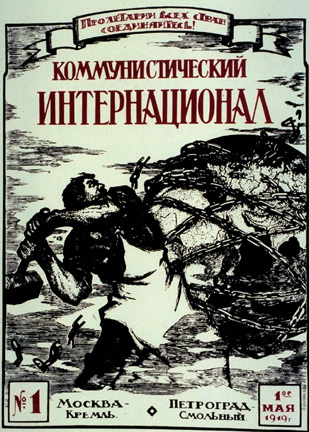 The Executive Committee of the Communist International made a proposal to the Amsterdam International in connection with famine relief to Russia. It repeated this proposal in connection with the White Terror and persecution of workers in Spain and Yugoslavia. The Executive Committee of the Communist International is currently making new proposals to the Amsterdam and Second Internationals, and also the Two-and-a-Half International, in connection with the initial work of the Washington conference, which has shown that a new imperialist slaughter threatens the international working class. The leaders of the Second, Two-and-a-Half and Amsterdam Internationals have shown by their behaviour so far that when it comes to practical activity they in practice ignore their slogan of unity. In all such situations the task of the Communist International as a whole and of each of its sections separately will be to explain to the broadest circles of workers the hypocrisy of the leaders of the Second, Two-and-a-Half and Amsterdam Internationals, who put unity with the bourgeoisie before unity with the revolutionary workers, by staying, for example, in the International Labour Organisation of the League of Nations and by being party to the Washington imperialist conference instead of organising the struggle against imperialist Washington etc. However, the rejection by the leaders of the Second, Two-and-a-Half and Amsterdam Internationals of this or that practical proposal from the Communist international will not make us give up this tactic, which has deep roots in the masses and which we systematically and steadily must develop. Whenever our opponents reject proposals for joint struggle, the masses must be informed so that they can learn who the real destroyers of the united workers’ front are. Whenever our opponents accept a proposal, we must aim gradually to intensify the struggle and raise it to a higher level. In either case it is essential to draw the attention of the broad masses to the talks between the Communists and the other organisations and to interest them in all the fluctuations of the struggle for the united revolutionary workers’ front. In putting forward this plan, the Executive Committee of the Communist International directs the attention of all fraternal parties to the dangers that in certain circumstances could be involved. Not all Communist Parties are sufficiently developed and consolidated; not all have finally broken with centrist and semi-centrist ideology. There may be cases of bending the stick too far the other way; there may be tendencies which amount to the dissolution of the Communist Parties and groups into a formless united bloc. If the use of this tactic is to advance the cause of Communism, the actual Communist Parties carrying it out must be strong, united and under an ideologically clear leadership. The groupings within the Communist International itself which, with greater or lesser justification, are considered Right or even semi-centrist, are clearly made up of two different tendencies. Some elements have not really broken with the ideology and methods of the Second International, have not freed themselves from reverence for its former organisational strength and, half-consciously or unconsciously, are still seeking ideological agreement with the Second International and, accordingly, with bourgeois society. Other elements, opposed to formal radicalism and the mistakes of so-called Leftism, etc., are anxious that the newly-formed Communist Parties should be more subtle and flexible in their tactics, so that they can more rapidly strengthen their influence among the rank-and-file of the working masses. The rapid pace of development of the Communist Parties has always appeared to push both these tendencies into the same camp, even into the same grouping. The use of the methods suggested by us, which are designed to give Communist agitation a base in the unified mass activity of the proletariat, is the most effective way of uncovering the truly reformist tendencies within the Communist Parties and, if applied correctly, these methods will greatly help the internal revolutionary consolidation of the Communist Parties, both by re-educating through experience impatient or sectarian Left elements and by ridding the Parties of reformist ballast. The united workers’ front must mean the unity of all workers willing to fight against capitalism – including those workers who still follow the anarchists, syndicalists, etc. In the Latin countries there are still many such workers, and in other countries, too, they can contribute to the revolutionary struggle. From the start of its existence the Communist International has adopted a friendly line in its relations with those elements among the workers who have gradually overcome their prejudices and are moving towards Communism. Communists must be all the more attentive towards them now that the united workers’ front against the capitalists is becoming a reality. In order finally to concretize this work along the lines indicated, the Executive Committee of the Communist International resolves to call in the near future an extended session of the Executive Committee of the Communist International with twice the usual number of delegates representing each Party. The Executive Committee of the Communist International will closely follow every practical step taken in this sector of work and asks all the Parties to inform it of every attempt made and every gain won in this direction, giving full factual details.